If you want to make extraordinary returns in stocks, make sure you get paid. And when it comes to getting paid in the stock market, one strategy works better than any other. First, know that most people lose money in the stock market. They lose because they're always looking for excitement... they're always looking to buy the next big company... like the next Starbucks or the next Google. After all, these companies have returned early investors thousands of percent gains. But what most folks ignore is that for every big winner like Starbucks, there are hundreds of failed coffee chains. The odds of investing in a company on the verge of Starbucks-like success are tiny... less than 1%. So with the "excitement" line of thinking, most folks have lost even before the game begins. Market research firm Standard & Poor's has put together a list of the best dividend-paying companies. It calls these companies the "Dividend Aristocrats." The criteria is simple... A Dividend Aristocrat is any S&P 500 company that has raised its dividend for at least 25 years running. This list includes many of the companies I told you about in DailyWealth two weeks ago... names like Coca-Cola and Consolidated Edison. These companies sell "the basics" – products we consume regardless of the economic climate. And they pay steady, growing dividends. This provides a level of safety other businesses cannot match. And as stocks sold off this month, many of these businesses held strong. But these companies don't just outperform in bad times. 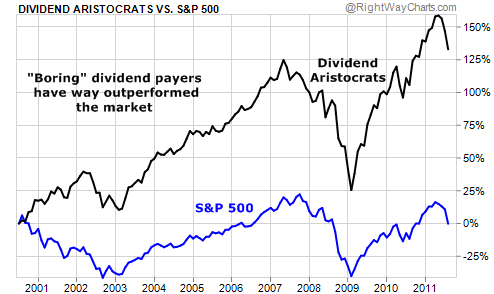 This chart shows the total return (including dividends) of the S&P 500 and the Dividend Aristocrats. As you can see, the S&P 500 is flat over this time span. But the Dividend Aristocrats have returned over 130%. The reason for this huge outperformance is just common sense. By owning relentless dividend payers, you're investing in shareholder-friendly companies with robust business models. By owning a broad S&P 500 index fund, you're investing in lots of companies that don't pay their shareholders a dime... companies that might not even be around in a few years. It's a no-brainer. One final, amazing fact: The Dividend Aristocrats have provided a positive return, even if you bought right at the broad market's peak in 2007. How many stocks can you say that about? Buying companies that sell "the basics" – and making sure you get paid – might not be as exciting as looking for the next great growth stock. But if you're more interested in building wealth than gambling, this is the strategy for you. After the stock market dropped 17%, Brett compiled a list of companies that weathered the storm… a list of the "safest companies in the world." Get the details on what he found here: The World's Safest Dividend-Paying Stocks. Retirement expert "Doc" Eifrig has been tracking the safest long-term trend in the market for DailyWealth readers: "Health care companies have one of the world's greatest tailwinds at their back," he writes. Even better, one company he found increased its dividend for 42 straight years. Selling pressure in stocks is so strong, not even the great Salesforce.com (CRM) can hold up. Since the stock market bottom in 2009, software firm Salesforce.com has been one of highest performing and most controversial stocks in the market. Shares gained around 500% from early 2009 to mid-2011. During this rise, many of the world's smartest investors have pointed out the stock is absolutely, absurdly expensive... trading for crazy multiples of its book value and cash flows. They've called it a share price disaster waiting to happen. But as you can see from this week's chart, the negative press did little to blunt CRM's huge uptrend. It took the recent mini-panic to halt the thing. After enjoying a big uptrend from 2009-2010, CRM reached a peak around $150 last December. It then drifted sideways for a several months and eventually hit a new high. But as you can see, the recent market selloff has shattered CRM's uptrend. Should folks continue to flee the market, expensive stocks like CRM stand to suffer the biggest losses. Share price decline in the world's largest steelmaking company, Arcelor Mittal, over the past month. "This essentially silences anyone who might be able to shed some light on the event..."
Doug Casey: "We are exiting the eye of the storm"
"Shorting gold seems like the ultimate contrarian trade... which is why it's probably right..."